OK Keratin Treatment is the most effective of all keratin treatments on the market today. It was developed and improved in cooperation with a leading university research biochemist. We added choice ingredients to nourish and enrich the hair, increasing its supplements and sheen. These ingredients also improve the texture of hair that has been previously damaged by severe chemical treatment. The result is the silkiest, healthiest-looking hair one can imagine. Treated hair is brimming with shine, body and bounce. Due to superior formulation, you can shampoo after just 24 hours. First wash the hair with OK Keratin Color Safe Shampoo TWO TIMES. Second use a coloring brush to apply the formulation to the hair, combing out the excess. Third air dry the hair completely. Finally seal in the silkiness with a hot iron at the temperature of 450°, one lock of hair at a time. 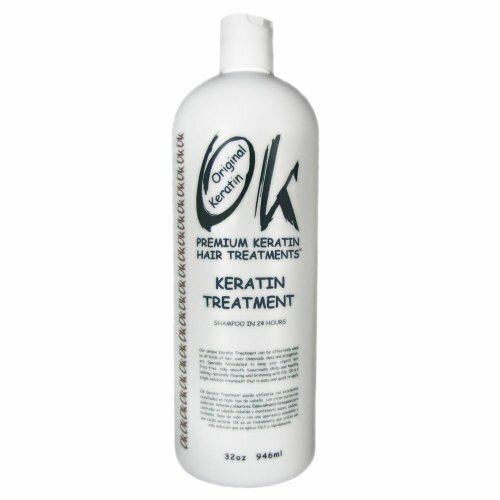 If you have any questions about this product by OK Original Keratin, contact us by completing and submitting the form below. If you are looking for a specif part number, please include it with your message. Agi Max Brazilian Keratin Hair Treatment Kit 1 liter - 3 Steps (3 x 1000ml) - The Best Straightening!